Talita Rise Up is our partner ministry in the southern region of Ethiopia that receives babies that are found abandoned. 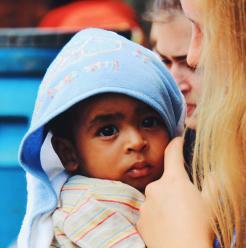 One of their biggest needs is baby supplies to properly care for these babies and provide them with adequate nutrition. Your donation of $50 will provide this baby care bundle that includes a pack of diapers, a package of wipes, and a can of formula. *Fundraisers will receive credit for this donation if their name is selected during checkout. *Our Ordinary Hero staff and volunteers in Ethiopia will distribute the donation items.